I recall having two books when we first got our Atari 400 and then 800 back in the day. The first was Atari BASIC as a self-teaching guide. The second was Your Atari Computer (aka The Purple Book) by Lon Poole, Martin McNiff, and Steven Cook that was published in 1982. I remember devouring the Purple Book cover to cover. I even typed in the player-missile graphics demo in BASIC that is shown on the cover. 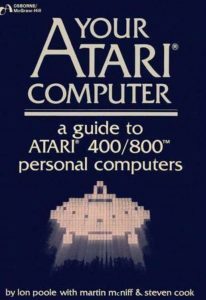 This book is a bible for new Atari computer owners as it goes over the basics of Atari hardware and BASIC programming. It is still relevant for those getting into Atari 8-bit computing for the first time or for the first time since the 1980s. It is really fun to read for experience Atari users as well. I highly recommend it. The Purple Book is available on The Internet Archive in the original edition or the updated edition for the XL line of computers. You can also find plenty of used copies on eBay and other used book sellers. A classic! If you own five books about Atari 8-bit computers this has to be one of them. Enjoy!